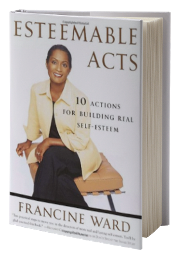 Francine knows how to turn around the struggle with low self-esteem – not with drugs or other chemicals – but with consistent, small, manageable, daily actions she calls esteemable acts. When you read Esteemable Acts you will learn how to break down big, scary actions into small doable steps so you can build your self-esteem and live the life of your dreams! Hardcover Edition. Price: $15. 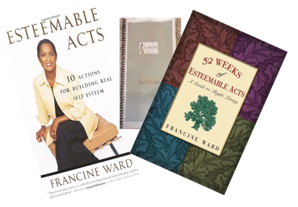 “Francine Ward is a walking/talking role model of a confident woman who shows through her everyday esteemable actions that it’s never too late to become the person we want to be. Her book is full of practical suggestions that have the power to change our lives for the better, if we’ll just put them into practice. An inspiring resource from someone who’s been there, done this. Read it and reap.” – Sam Horn, author of Tongue Fu! and What’s Holding You Back? Do you sometimes feel everyone around you has been given break, except you? Do you hate your job, long for a new and different career? Are you unhappy with your weight, your attitude, your old ideas? 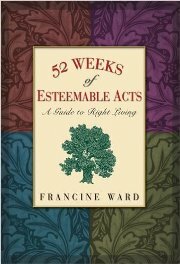 If you answered “yes” to any of the above then, 52 Weeks of Esteemable Acts: A Guide to Right Living is for you. 52 Weeks provides you with tools that are easy to understand and simple to follow, broken into small, manageable, baby steps, because the author knows that success is about taking small, consistent actions every day to reach your desired goal – Esteemable Actions. This Workbook Study Guide is the perfect companion to Esteemable Acts: 10 Actions for Building Real Self Esteem, and a great addition to your Esteemable Acts library. 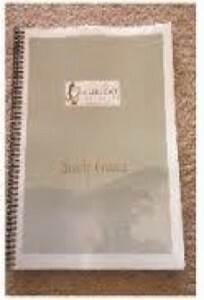 It is designed for either individual use, or as a tool when working with groups of people. Checklists – Questions – Resources – Affirmations – And lots more! All designed to get you off the couch and into your life through targeted, affirmative actions. This Jumbo Mug is the perfect drinking vessel, and is large enough to serve soup, cereal, or rice. 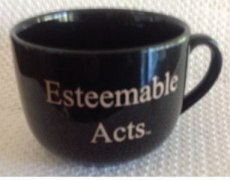 For those, like me, who like to eat and drink out of a LARGE cup or bowl, this is a great gift for yourself or others.